Going into town to see the lights and feel the excitement of Christmas must be one of the highlights of the year. Pure happiness. Then, there is the commercial site. I only found a German site and then it didn’t say from which year these statistics are (though looking at the link they seem to be from 2010). 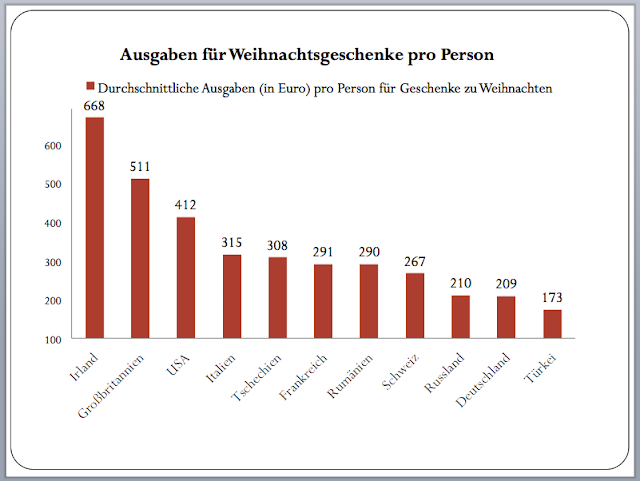 But Ireland is most definitely leading the field when looking at how much people spend on Christmas presents per person. More than three times as much as the Germans!